Institutional Water Temperature Controls. 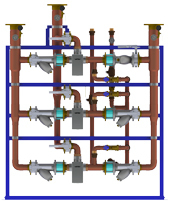 . . Armstrong offers both a complete system and a modular component solution to mixed water temperature control across the entire Institutional Hot Water Distribution network. The Brain® Digital Recirculation Valves. . . 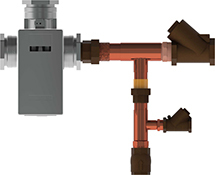 The Brain® Digital Recirculating Valve (DRV) and Digital Mixing Centers (DMC) are specifically designed for use in a pumped recirculating hot water system. 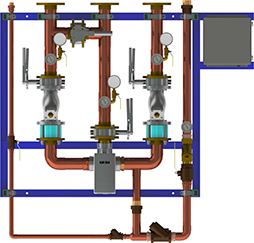 Digital Recirculation Valves (DRV) are designed specifically to be the primary water temperature controller in a continuously pumped circulating hot water system. 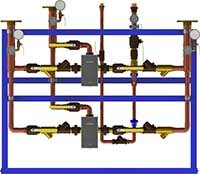 Digital technology provides enhanced water temperature control accuracy which resists zero system demand "Temperature Creep" without the use of a manual throttling valve or a temperature activated pump shut-off device (aquastat). Model DRV40 is a Digital Re-Circulating Valve (DRV) designed for systems which experience diverse draw-off between 0 - 41 GPM* and is provided with 1.5" NPT connections. Model DRV50 is a Digital Re-Circulating Valve (DRV) designed for systems which experience diverse draw-off between 0 - 73 GPM*. DRV50 is a model DRV80 provided with bushed down 2" NPT connections. Model DRV80 is a Digital Re-Circulating Valve (DRV) designed for systems which experience diverse draw-off between 0 - 165 GPM* and is provided with 3" NPT connections. * Note: Flow capacities indicated at 7.5 ft/sec pipeline velocity. 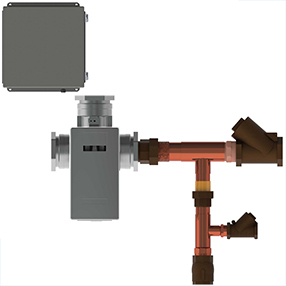 Digital Recirculation Valve (DRV), with BrainScan® - Hot water monitoring control module, designed specifically to be the primary water temperature controller in a continuously pumped circulating hot water system. 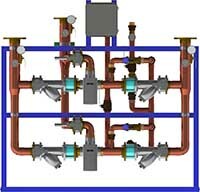 Digital Recirculation Valve (DRV) designed specifically to be the primary water temperature controller in a continuously pumped circulating hot water system. 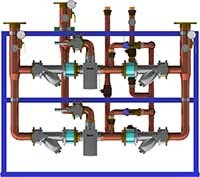 DRV40R, DRV50R, and DRV80R are supplied with a recirculation return manifold as shown. 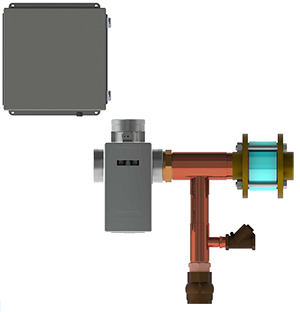 Digital Recirculation Valve (DRV), with BrainScan® - Hot water monitoring control module, designed specifically to be the primary water temperature controller in a continuously pumped circulating hot water system. 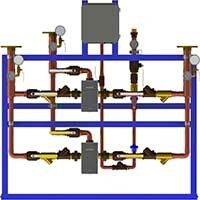 DRV40RBS, DRV50RBS, and DRV80RBS are supplied with a recirculation return manifold as shown. 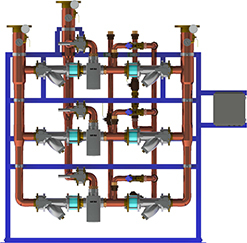 Fully Digital Mixing Centers (DMC) designed specifically to be the primary water temperature controller in a continuously pumped circulating hot water system. Model DMC40 is a pre-piped Digital Mixing Center supplied with all requisite installation components. 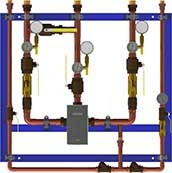 DMC40 is designed for systems which experience diverse draw-off between 0 - 41 GPM* and is provided with 1.5" union connections. Model DMC40-40 is a pre-piped Digital Mixing Center supplied with all requisite installation components. DMC40-40 includes two DRV40 and is designed for systems which experience diverse draw-off between 0 - 115 GPM* or require DRV redundancy. DRV40-40 is provided with 2.5" union connections. Model DMC50 is a pre-piped Digital Mixing Center supplied with all requisite installation components. DMC50 is designed for systems which experience diverse draw-off between 0 - 73GPM* and is provided with 2" flanged connections. Model DMC80 is a pre-piped Digital Mixing Center supplied with all requisite installation components. DMC80 is designed for systems which experience diverse draw-off between 0 - 165GPM* and is provided with 3" flanged connections. Model DMC80-80 is a pre-piped Digital Mixing Center including two DRV80 supplied with all requisite installation components. DMC80-80 is designed for systems which experience diverse draw-off between 0 - 294 GPM* and is provided with 4" flanged connections. Model DMC80-80-80 is a pre-piped Digital Mixing Center including three DRV80 supplied with all requisite installation components. DMC80-80-80 is designed for systems which experience diverse draw-off between 0 - 459 GPM* or require DRV redundancy and is provided with 5" flanged connections. 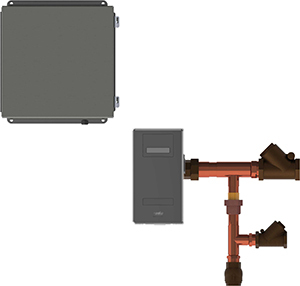 Fully Digital Mixing Centers (DMC), with BrainScan® - Hot water monitoring control module - (BS - Connectivity Module), designed specifically to be the primary water temperature controller in a continuously pumped circulating hot water system. Same as Model DMC40, with BrainScan® (BS) Connectivity Module - hot water monitoring control. Same as Model DMC40-40, with BrainScan® (BS) Connectivity Module - hot water monitoring control. Same as Model DMC50, with BrainScan® (BS) Connectivity Module - hot water monitoring control. 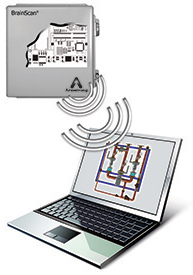 Same as Model DMC80, with BrainScan® (BS) Connectivity Module - hot water monitoring control. Same as Model DMC80-80, with BrainScan® (BS) Connectivity Module - hot water monitoring control. Same as Model DMC80-80-80, with BrainScan® (BS) Connectivity Module - hot water monitoring control. The integral RS485 Serial Port provides an ability to remotely program the DRV and update the firmware via BS - Connectivity Module or Modbus. The integral RS485 Serial Port can receive the following outputs from the DRV and communicate them via BS - Connectivity Module or Modbus. The integral RS485 Serial Port can receive the following selfdiagnostic error messages from the DRV and communicate them via BS - Connectivity Module or Modbus. The integral RS485 Serial Port on The Brain® Digital Recirculating Valve (DRV) can be used to connect the DRV directly to a Building Automation System (BAS) using Modbus RTU or to an optionally selected BS - Connectivity Module which enables interface with a BAS operating on Modbus, BACnetTM or LonWorksTM protocols. When configured for Modbus the DRV becomes a Remote Terminal Unit (RTU). The BAS will need to be using a Modbus RTU format. When connected directly to a BAS using Modbus, the DRV can be assigned a unique network address which is programmed via the integral DB9 external port. SenseTM Single Point of Use | Digital. 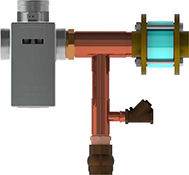 . . SenseTM is a series of 4 individual point of use digital mixing valves designed for installation at the point of use to allow user control of water temperature and flow. 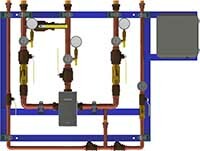 The range has been designed to offer individual lavatory, individual shower, individual bath fill and individual bath/shower combination digital flow and temperature control primarily in healthcare installations where user safety and Legionella risk reduction is paramount. Concealed electronic mixing valve with surface mount control panel for lavatory flow and ±2°F (±1°C) temperature control. Concealed electronic mixing valve with surface mount control panel for individual shower flow and ±2°F (±1°C) temperature control. Concealed electronic mixing valve with surface mount control panel for individual bath fill and ±2°F (±1°C) temperature control. Concealed electronic mixing valve with surface mount control panel for bath and shower flow and ±2°F (±1°C) temperature control. Thermostatic Mixing Valve of "sealed for life" replaceable cartridge construction. Compact design is ideally suited for use at or near the final point of use to deliver a pre designated mixed water temperature to either a single or a small "group" of lavatories. Complete operating mechanism is enclosed in a durable disposable polymer cartridge for ease of maintenance. Powerful internal movement of the hot and cold water proportioning mechanism resists mineral deposition. * Use of the trim set allows for full temperature control to within 5°F (2°C) of either inlet supply along with an integral maximum temperature limit stop and single temperature locking option. Features two Thermostatic Mixing Valves and derivative assemblies designed specifically for use in non-return "dead leg" applications. The range has been designed to offer accurate temperature control in installations where there are diverse flow requirements. Thermostatic Mixing Valve of "sealed for life" disposable cartridge construction. 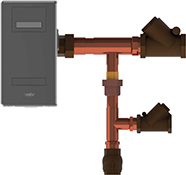 Compact design with top and/or bottom blended water outlet makes Model 320 ideal for recessed enclosure, plumbing chase and utility/mechanical room installation. 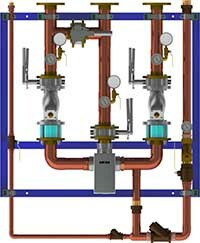 A derivative assembly of the standard Model 320 Thermostatic Mixing Valve of "sealed for life" disposable cartridge construction. Compact design with top and/or bottom blended water outlet makes Model 320D ideal for recessed enclosure, plumbing chase and utility/mechanical room installation. Thermostatic Mixing Valve for remote/secure cabinet mount "dead leg" group fixture control. Model 320 is ideal for this application due to its low service, single "sealed for life" disposable cartridge construction, low inlet to outlet temperature differential requirement and low flow single fixture control capability. 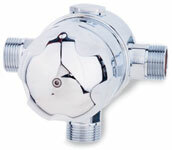 Model 425 Thermostatic Mixing Valve for institutional group fixture water temperature control. Ideal for recessed enclosure, plumbing chase and utility/mechanical room installation. Powerful internal mechanism and stainless steel operating mechanism resist mineral deposition. 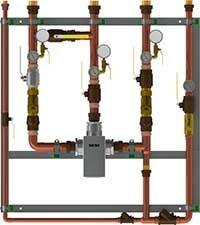 A derivative of the standard Model 425 Thermostatic Mixing Valve for institutional group fixture control. 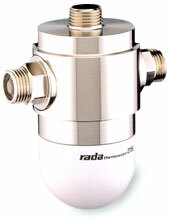 Capable of close temperature control at diverse flow rates between 2 gpm (7.5 lpm) and 49 gpm (185 lpm). Able to blend to within 5°F (2°C) of either inlet supply due to "low seepage" across internal proportioning mechanism. 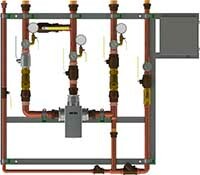 Thermostatic Mixing Valve (TMV) for remote/secure cabinet mount "dead leg" group fixture control. Model 425 is ideal for this application due to its low service, low inlet to outlet temperature differential requirement and low flow single fixture control capability.